Melt butter or margarine in a large, heavy stock pot over medium heat. Add onions and saute until translucent, about 4 minutes. Add garlic and cook for another minute, until just frgrant. Add chicken stock and bring to a boil. 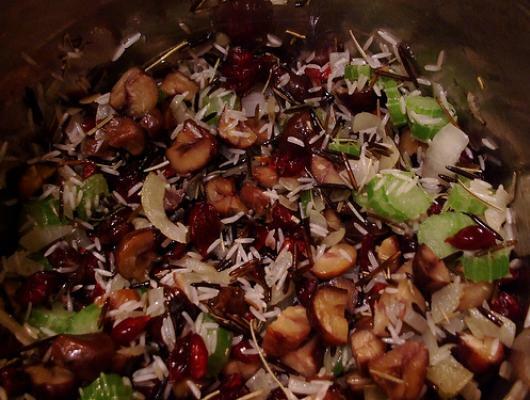 Add wild rice and cover, reducing heat to simmer for 30 minutes. Stir in brown rice, recover and simmer until rice is tender and most of the liquid has been absorbed (30-35 minutes). Stir in cranberries and herbs and continue to cook until the remaining liquid has been absorbed. Stir in hazelnuts and chopped green onions, season with salt and pepper to taste. *Loosely* pack stuffing into the main cavity of your turkey. Pour remaining stuffing into a greased ceramic or glass baking dish and cover with greased foil (butter/oil side down). Cook turkey as per instructions and bake the dish of stuffing alongside for 30-35 minutes or until heated through. Preheat oven to 350°F. Grease a large (15x10x2-inch) baking dish (glass or ceramic). Pour/scrape stuffing into the baking dish and cover with greased foil (butter/oil side down). Bake for 40-45 minutes or until heated through.